Do you want to escape the busy life of New York and spend a day in the famous Hamptons beach? Do as the rich and famous do and arrive in style in a luxury coach! Book this roundtrip ticket and enjoy a relaxing hassle-free experience. The luxury coach offers light snacks and beverages. Without wasting time figuring out how to get there, the coach will drive you in about two and half hours directly to the popular seaside resort. When you arrive in the Southampton you are transferred to a beach shuttle and will travel a short trip through Southampton Village to Coopers Beach. Enjoy a day on the beach on the beautiful Atlantic coast. You can rent a beach chair and umbrella at own cost. If you get hungry, enjoy a 10% discount at the beach concession stand. 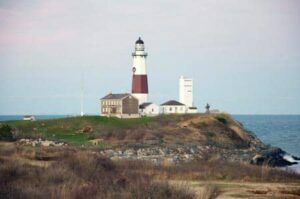 In the late afternoon you will be picked up from the beach and return to Southampton where you board the coach and travel approximately 2 hours back to Manhattan. Note: Don’t forget to bring sunscreen and beach towels. Each passenger is allowed 1 suitcase and 1 carry-on bag. After purchasing, you will receive a voucher that you can print out and use as your ticket for the transfer. You can book this Hamptons New York Daytrip instead.